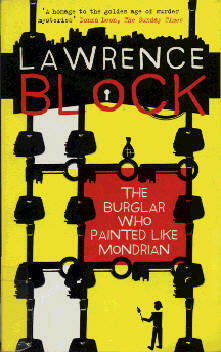 This page is for covers of various edition of Lawrence Block's book, The Burglar Who Painted Like Mondrian. 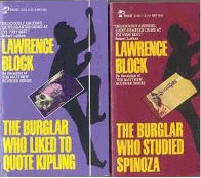 Penguin Audiobooks, read by the author. 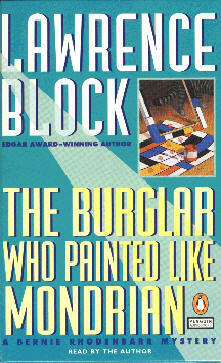 This cover also seems the most common for both paperback and hardcover books. From the detail of the illustration, I'd say the frame is too busy. 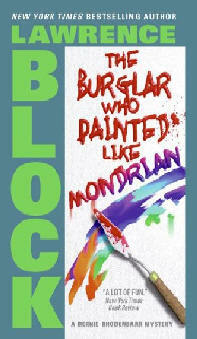 My paperback copy, details to follow (when I find it). Well, actually I had to buy another and after all that there is no credit for the designer. 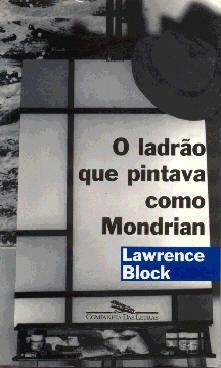 It is a Pocket Books edition, a division of Simon & Schuster. I'm guessing the designer has not read the book, but maybe I am being too literal and precious. 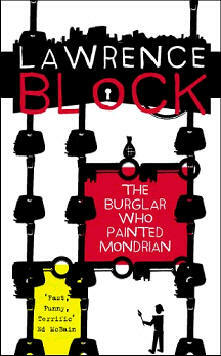 Perhaps a book jacket illustrator just interprets the title, while leaving enough spaces to include the wordage. 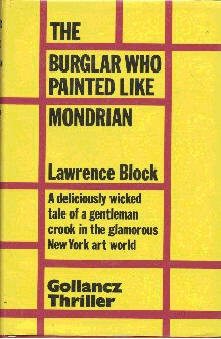 A glance at some of the other titles in the series shows where the artist is coming from on these. 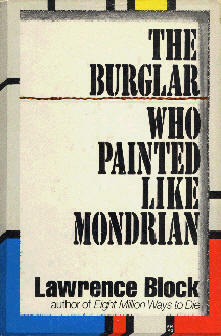 UK Hardback first edition 1984, published by Victor Gollancz. Unfortunately, there is no mention of the jacket designer. 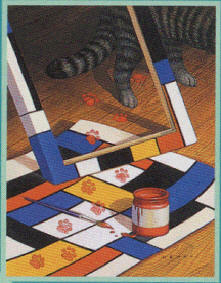 Large print version, complete with the Significant Paw Prints. 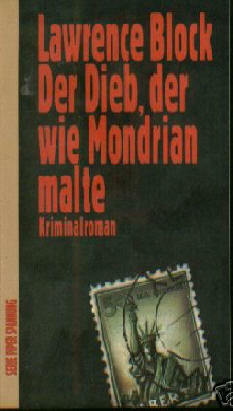 Published 1999. No indication of who designed the cover. No Exit Press, published 2002. Having looked at the next couple of titles due out later, there seems to be a skyline and keys motif running throughout the new editions, as shown in Ted Williams and Choosers. 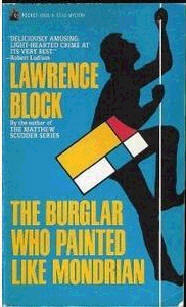 This yellow version is the UK edition. This was No Exit's previous offering, so the above is a distinct improvement on that. A new one on Amazon from HarperTorch, 2005, perhaps the most inappropriate yet. Green? Who are these people? 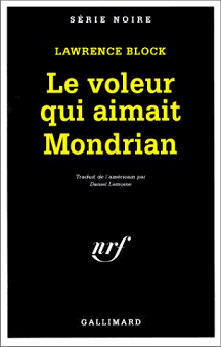 A disappointingly minimalist and un-mondrianesque French offering. 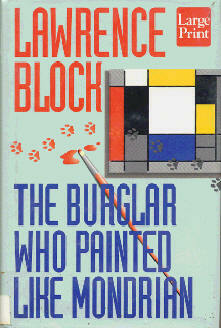 They could at least have tried some colour variations in the title. 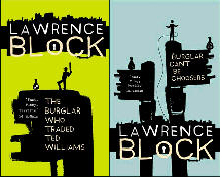 The next three are from the collection of Mr Block himself. Thanks to Lawrence for digging them out and to Maggie for sending them (twice). Descriptions from LB in italics. 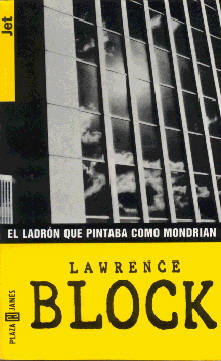 The other's the Spanish edition which shows the sky reflected in the side of a modern office building, with a grid effect. You can sort of see what the art director was trying for. Designer uncertain, but the name Picaro Taro is under the large light blue rectangle and a Google scan suggests this person is a designer. 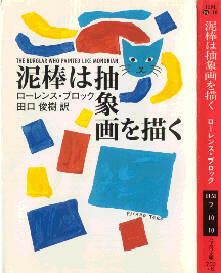 I also have a Japanese edition, published by Hayakawa, that is loopy enough to be interesting---a cat's head, and a batch of rectangles, all in various primary colors, sort of floating in the air. I also have the Greek edition, but don't think it would interest you---it copies the No Exit cover, with the floating hat and nothing at all Mondrianesque anywhere. I now have a copy of this thanks to a friendly Japanese second-hand bookseller in Cardiff who ordered it from Amazon Japan for me. 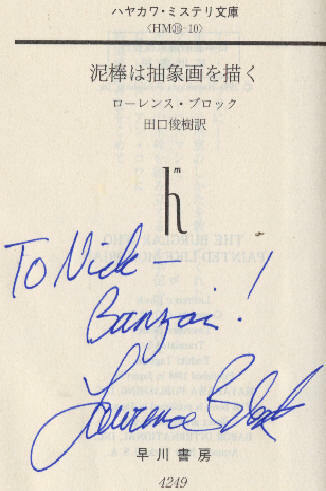 Signed by the author in London a while later. A remarkably incongruous contribution from Germany, offered on eBay.